The crimes of sexual abuse of children by priests have caused untold damage to countless numbers of people. They have ruptured the essential trust necessary for the bonds of faith to flourish in our parishes and community. I am especially grateful to the men and women survivors who have courageously uncovered the darkness of sexual abuse by clergy. Their spiritual and emotional suffering has a particular claim on all of us. One facet of rebuilding trust is fulfilling our commitment to financial transparency, both today and in the future. The report “Financial Disclosure of the Archdiocese of Boston Regarding Sexual Abuse Settlements and Related Costs” is an important aspect of honoring our commitment. This report seeks to provide a clear, understandable picture of the financial costs the Archdiocese incurred in responding to and settling civil claims, as well as of the sources from which the Archdiocese drew funds to resolve the claims brought against it and settled to date. As you will see, the substantial financial costs detailed in today’s report reflect the staggering scope of the crisis. It is understandable that some may view any effort to discuss the sexual abuse crisis in financial terms as minimizing the severity of the pain and loss caused by clergy sexual abuse. We must never forget the profound suffering survivors, their families and the Catholic community have endured as a result of the tragic crimes perpetrated against children. The sexual violations of children by priests and the failure of Church leaders to properly respond are a source of deep shame for which I apologize and humbly beg your forgiveness. I again pledge to do everything possible to ensure a safe environment for our young people and to provide pastoral and counseling support to survivors and their families. Nothing is more important at this moment in the life of the Church in this Archdiocese. In this Easter Season of Hope and New Life may the Risen Savior guide us in healing and renewal. In October 2005, then Archbishop Sean O’Malley publicly outlined both the steps the Archdiocese would take to respond to the financial challenges it faces, and how the Archdiocese intended to carry out its commitment to financial transparency. As part of that outline, the Archbishop committed to releasing in the first quarter of 2006 the audited consolidated financial statements for the two fiscal years ending June 30, 2005, along with full disclosure and explanation of the Archdiocese’s organizational structure. The Archbishop also committed to releasing a full accounting of the payments made and sources used by the Archdiocese to fund sexual abuse settlements. This report addresses the second of those two commitments – an explanation of the payments made to fund sexual abuse settlements and related costs and the sources of those funds. The report has been subjected to review by members of an independent volunteer committee established by the Archbishop. The committee is comprised of financial and other experts who have had no prior involvement with the finances of the Archdiocese. This report is best read in conjunction with the other report, on the overall financial structure and condition of the Archdiocese, which is being released simultaneously. The Archbishop’s commitment to financial transparency requires that the Archdiocese provide a clear, understandable picture of the financial costs the Archdiocese incurred in responding to and settling civil claims, as well as of the sources from which the Archdiocese drew funds to resolve the claims brought against it and settled to date. The Archbishop recognizes, however, that any effort to discuss the sexual abuse crisis in financial terms may be viewed by some as ignoring or minimizing the severity of human suffering resulting from clergy sexual abuse in the Archdiocese. Neither is the intent of this report. Rather, this report seeks only to provide members of the Church and the general public with a clear explanation of the financial costs incurred in settling sexual abuse claims and how they have been paid to date. An earlier report issued by the Archdiocese in February 2004 attempted to report on the human dimensions of the sexual abuse crisis.1 That earlier report, covering the period from 1950 through 2003, provided statistics on the number of accusations made against priests of the Boston Archdiocese involving sexual abuse of a minor, the number of priests so accused, the years during which the abuse occurred, and the years when the abuse was reported, among other information. Although there was brief discussion at the end of the Archdiocese’s February 2004 report as to the total amount of money paid by the Archdiocese through December 2003 in settling sexual abuse claims, and the total amount recovered from insurance at that time, that report did not offer a detailed discussion of the financial aspects of the crisis. The following report presents the ultimate sources and uses of the funds actually expended by the Roman Catholic Archbishop of Boston, a Corporation Sole (hereinafter referred to as the “Archdiocese”), to settle civil abuse claims that were made and settled prior to June 30, 2005. The report also describes other related costs paid prior to June 30, 2005, including legal costs incurred by the Archdiocese to defend or settle civil cases, costs for the Archdiocese’s pastoral response, costs for abuse prevention and training, and other costs discussed below. Two charts, which depict the sources and uses of the funds expended, are attached to this report. Sexual Abuse Settlements. The total amount expended by the Archdiocese to settle sexual abuse claims prior to June 30, 2005 was $127.4 million. A total of 895 settlements were reached. These figures include the global settlement of 541 claims reached by Archbishop O’Malley in the fall of 2003 at a cost of $84.1 million. The $127.4 million figure (see paragraph above) represents the total of all payments made by the Archdiocese to survivors of sexual abuse in order to resolve sexual abuse claims brought against the Archdiocese. The vast majority of those settlements involved accusations of sexual abuse of children by priests of the Boston Archdiocese, including related claims by parents of those children. However, a small number of the settled claims involved either sexual abuse that occurred between adults, or sexual abuse of children committed not by priests of Boston, but rather by priests from other dioceses or religious orders or by lay persons. This report collects, to the extent possible, the total costs of resolving all sexual abuse claims made against the Archdiocese which were settled prior to June 30, 2005. Costs for Pastoral Response and Abuse Prevention and Training. In addition to the $127.4 million paid to survivors in actual settlements of sexual abuse claims, the Archdiocese expended approximately $8.8 million from 1993 through the end of June 2005 to cover the expenses associated with administering abuse prevention efforts and funding outreach to promote healing and reconciliation with survivors and others harmed by sexual abuse. Through its Office of Volunteer Resources, the Archdiocese conducts annual CORI checks of Archdiocesan and religious priests, deacons, educators, volunteers, and other personnel. The Archdiocesan Office of Child Advocacy, Implementation, and Oversight ensures that clergy, staff, and volunteers receive training in child safety, abuse prevention and reporting, as well as oversees the implementation of “safe environment training” programs for parochial school and religious education students. As part of its pastoral response to clergy sexual abuse, the Archdiocese funds the costs of outside therapy requested by abuse survivors. Since early 2002, when the clergy abuse crisis erupted in Boston, that counseling assistance has been provided through the Office of Pastoral Support and Outreach (“OPSO”). Under the program administered by OPSO, the Archdiocese funds weekly therapy and related medications. This support is available whether or not the survivor has brought a claim against the Archdiocese, and continues to be available after a claim has been settled. In all settlements reached since mid-2003, the agreements expressly provide that the settlement amount is in addition to the funding for counseling available through OPSO. These services are also available to all survivors, including those who settled prior to the Archbishop’s arrival. The Archdiocese expects that the cost for therapy assistance to survivors will continue for a very long time. Under the program administered by OPSO, there is no cutoff for access to those therapy services – they are provided for as long as the survivor needs them. In the past fiscal year (ending June 30, 2005), the program funded therapy for 299 survivors, at a cost of $1.16 million. 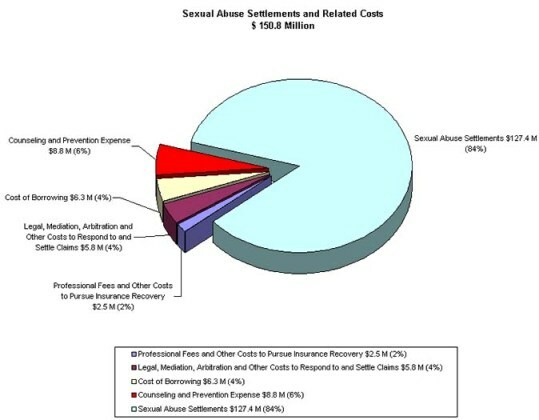 Other Costs Related to Sexual Abuse Claims. In addition to the costs incurred by the Archdiocese for therapy assistance and other costs to administer training and sexual abuse prevention programs, the Archdiocese has incurred an additional $14.6 million to cover the following: legal, mediation, arbitration, and other costs to respond to and settle claims ($5.8 million); legal, mediation, expert, and other costs to pursue recovery from insurers ($2.5 million); and costs of borrowing to finance the global settlement ($6.3 million). Summary of Costs. Taking into account the total costs of the sexual abuse settlements ($127.4 million) as well as the total of non-settlement costs incurred by the Archdiocese related to the sexual abuse claims ($23.4 million), the Archdiocese expended a total of $150.8 million through June 30, 2005. The Archdiocese has funded the settlement costs and the other costs related to sexual abuse claims from the following general sources: real property sales, including the sale of a portion of the Brighton property to Boston College; insurance coverage under policies issued to the Archdiocese; donations to fund therapy; and money reserved from the insurance fund of the Archdiocese. The sources designated have been sufficient to cover the costs of settlement and related expenses described above. It should be made clear, as in the past, that parish funds, money raised from the Promise for Tomorrow Campaign, the Annual Catholic Appeal, or the recent parish reconfiguration process will be used only for the purposes for which they have been collected and designated. They will not be used for settlement costs. Property Sales. The Archdiocese has used proceeds from the sale of non-reconfiguration properties it owned to assist in funding settlements and related expenses. In addition to the sale of the Brighton property, discussed below in further detail, the Archdiocese identified properties for sale in the spring of 2003, prior to Archbishop O’Malley’s arrival in Boston, as it sought to find ways to fund the settlement of the pending sexual abuse cases. Proceeds of these sales were segregated in a separate account. A total of $16.5 million from the sale of these properties had effectively been used through June 30, 2005, toward the costs of settlements and related expenses ($14.9 million expended from the separate account plus $1.6 million expended from the general fund through that date that was subsequently reimbursed from the separate account). The properties sold consist of nine former parish properties, all of which were closed prior to July of 2003. None of these closings were connected with the recent parish reconfiguration process. The Archdiocese also sold six other properties not related to former parish operations. All fifteen of these properties were made available for sale in order to fund the settlements. When Archbishop O’Malley arrived in Boston at the end of July 2003, facing approximately 550 pending claims, he set as his top priority as Archbishop compensating the victims of clergy sexual abuse. He put on hold previous efforts that were focused on resolving disputes with the Archdiocesan insurance carriers. As the Archbishop said at the time, it was most important first to resolve expeditiously the claims with the survivors, after which he would pursue the insurers. By October of 2003, the Archdiocese reached a “global settlement” with 541 of the then pending claimants, with payments due by the end of December 2003. The only feasible option to fund the $84.1 million in payments that were due under the global settlement agreement, plus related expenses, was to borrow the money. At that time, the Archdiocese borrowed $90 million. The settlement payments were made to the claimants at the end of December 2003. The Archdiocese repaid the loans taken out to fund the global settlement through the sale of a portion of the Brighton campus and also through pursuit of insurance recoveries. In June of 2004, the Archdiocese completed a sale of 43.5 acres of land and buildings on the Brighton campus to Boston College, including among other things, what had been the former Cardinal’s residence. The Archdiocese received at that time a total of $99.0 million. Against that amount, the Archdiocese incurred expenses to close the sale with Boston College approaching $1 million. Of the property sold at that time, approximately 28.7 acres belonged not to the Archdiocese, but to St. John’s Seminary. The Archdiocese first purchased those parcels of land from the Seminary to be conveyed to Boston College, along with 2.1 acres that the Archdiocese retained for parking. Under its purchase agreement with the Seminary, the Archdiocese paid the Seminary a total of $34.1 million, of which $29.2 million has been paid in cash and $4.9 million remains due in the form of a note. After deducting the expenses of the sale transaction and the cash payments made to the Seminary for the sale of the land, the net proceeds to the Archdiocese of the sale of the land in Brighton were $68.8 million. Insurance Recoveries. In March 2004, the Archdiocese brought suit in federal court against one of its two principal insurance carriers, Lumbermens Mutual Insurance Company. That litigation proceeded until February of 2005, when the parties achieved a settlement under which the Archdiocese received $20 million from Lumbermens. Lumbermens provided general liability coverage to the Archdiocese for a period commencing in the mid-1950s and lasting until early 1983. Approximately 80% of the claims that have been made against the Archdiocese pertain to the period of coverage provided by Lumbermens. Because of the severely deteriorated financial condition of Lumbermens at the time of the settlement, with Lumbermens out of the active insurance business and on the brink of financial insolvency, the settlement was done on a “buyout” basis in which, in return for the payment to be made by Lumbermens, the rights of the Archdiocese to claim against the Lumbermens under the policies in the future were extinguished. Of the total settlement amount ($20 million), $13 million under the agreement was allocated towards reimbursement for already settled claims, including the claims settled in the global settlement, and the balance of the money received, $7 million, was allocated toward settling or defending then pending or future claims. Shortly after the Lumbermens settlement was announced, the Archdiocese succeeded in reaching a settlement with its other principal insurance carrier, Travelers Insurance Company, which provided general liability coverage for the period spanning 1983-1989. The amount of the settlement, as reported at that time, was $8.5 million. With the settlement of the claims against Lumbermens and Travelers, the total amount received from insurance toward the $127.4 million in settlements negotiated and concluded by the Archdiocese through June 30, 2005 was $43.4 million. That figure includes some $21.9 million received from insurance carriers toward the costs of settlements reached before the global settlement. In addition to the above sources of funds, the Archdiocese also has used $20.1 million from reserves established for this purpose by the insurance fund of the Archdiocese over the years, and $2.0 million in donations made specifically for the purpose of funding therapy assistance for survivors. donations directed to providing therapy assistance to survivors ($2.0 million). The Archdiocese commits to provide, on an annual basis, supplemental financial reports regarding any future settlements for claims of sexual abuse and the sources of funds for those settlements. As was recently reported, the Archdiocese has received signed settlement agreements from eighty-eight claimants who have claims presently pending against the Archdiocese for sexual abuse. These settlements are included in a reserve that has been established on the books of the Archdiocese. The details of those settlements, as well as details of any other settlements reached within the current fiscal year, will be disclosed in the first annual supplemental report. The enormity of the financial costs resulting from the sexual abuse of children by clergy is a reflection of the devastating breach of trust experienced by survivors and the Catholic community at large. It is the hope of the Archdiocese that this and future financial reports will be one building block among many toward rebuilding a foundation for trust. 1 Statement of Archbishop Sean P. O’Malley Regarding Clergy Sexual Abuse in the Archdiocese from 1950-2003.